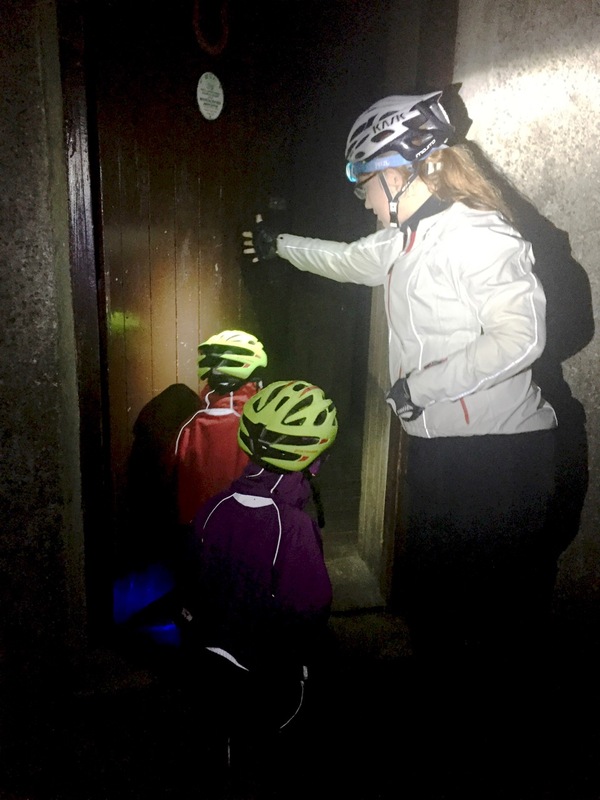 Family ByCycle: Bothying at Cadderlie - When cycle touring becomes night hiking! 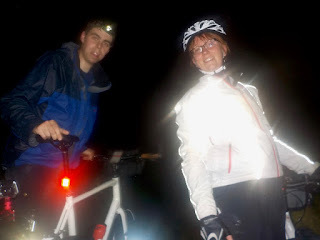 Bothying at Cadderlie - When cycle touring becomes night hiking! I have never before stayed the night somewhere without having any idea where I was. Our trip to Cadderlie was therefore a first in more ways than one! 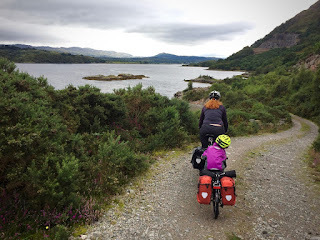 We did our research before we set off: we had the map, the GPS co-ordinates and a reliable account that the run in to the bothy was a 3.5 mile path that we would be fine to cycle along to get in, once past the loose stuff round the back of the quarry. It was raining, but the book suggested a walk in of only an hour or so. 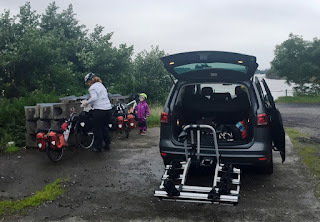 Cycling three and a half miles, we thought, even with a hilly route, we could do in half an hour, but despite best efforts to arrive before dark, we were to be thwarted, and we successfully missed all of the scenery that we had been planning to enjoy as we walked in. There has been very little "cycling" in - this was a slog - dragging loaded, heavy, recalcitrant bikes along loose, wet, steep gravel paths (and on some stints, hanging on for dear life to make sure that the bikes didn't hurtle down the loose, wet, steep paths without us!). We have therefore made much slower progress than the expected timings for walking in, instead of cruising along on our bikes. After three miles of trekking along the path, we began looking around expectantly. Are we nearly there? Tom decides it's time to consult the GPS to see where we are relative to the co-ordinates we need for the bothy. What a blow - the co-ordinates confirm our fears. We still have a mile to go and Rhoda is on the verge of nodding off in her seat and falling off. The jelly baby rations make their first appearance of the trip to keep morale up! What could be better encouragement to a three year old to stay awake than the promise of sugar? Nearly three quarters of a mile further on, we come across a large gate, closed across the path. The head torches and our bike lights reflect back at us from eyes belonging to unseen creatures. 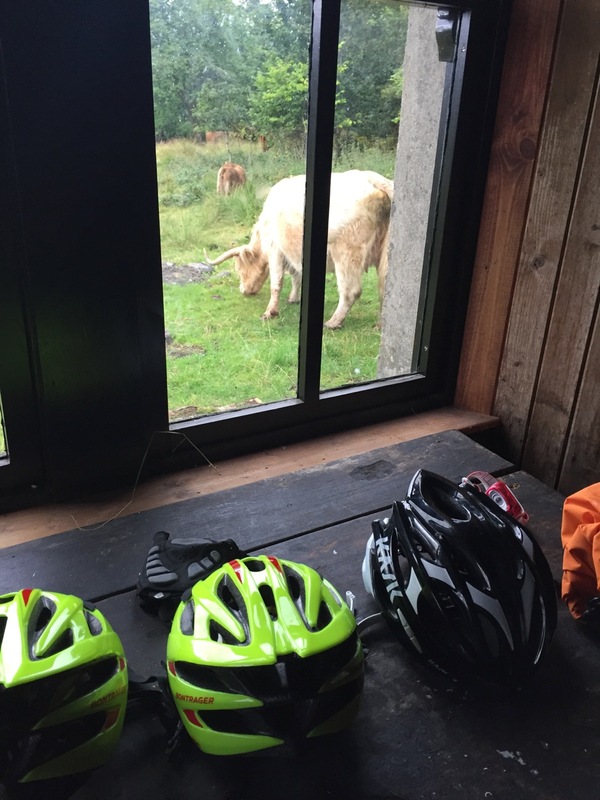 Just 400 yards short of the bothy, we encounter an entire herd of rather large 'heeland coos'. The sign on the gate informs us that this is a working farm and asks walkers using the path to keep the gate closed. Flashing our head torches in one another's eyes now, Tom and I have a brief exchange of glances. Too late to go back (no way my aching back and shoulders would cope with the return journey without a rest). Do we pitch the tent right here on the path and just crawl into it and admit defeat? Farmers don't leave bulls in fields with public paths across them without warnings, do they? Those coos have mighty big horns. Could we even pitch the tent here? The ground is very compacted - we'd never peg it out. We could probably see the blasted bothy from here if it weren't well after bedtime. We elect to do what any responsible parent would do. "Ruth, can you go and open the gate please?" Ha! That will sort it. A herd of heifers is no match for a toddler who's not had her tea yet. Ever the gentleman, Tom ventures first into the field, Rhoda back on the bike for the last push. Ruth slams the gate shut, jumps on her bike and I set off gamely behind Tom. "Are there any lions, Mummy? ", ponders Ruth aloud. I stifle the urge to giggle. The indistinct shapes around us start moving. And mooing. I reassure Ruth that there are no wild lions in Scotland. No, darling, no tigers either. Ruth is satisfied. Mummy and Daddy hold our breath - what will a field full of cows make of a family of cycle tourists turning up in the pitch dark and tramping across their field? Not a lot, as it turns out. They moo, and they bravely run away. We hear running water. It has to be close! Is that it? 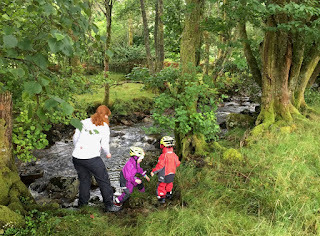 We pause by a stream and scour the area for any sign of a path or a roof (or a welcoming gleam of light from anyone already there!). Nothing. Nada. Zilch. Naff all. Tom looks again at the GPS. It should be 100m to the North and 300m to the east. We press on. Louder sounds of flowing water, and , is that the bridge? This one is bigger. Much bigger. There's a post... We stop. Nope, that's just a post. Wait, there's another one! Sensing he is the only one with a shred of hope left, Tom sets off on a solo reconnaissance mission. WE FOUND IT! Mummy cannot see it. Mummy is sceptical. Ruth is hungry. Rhoda is nodding off again. HONEST, IT'S RIGHT THERE! Tom shines everything we own in the direction he is pointing. I can finally make out the shape of a building in the gloom. There is a path. It is wet, muddy and rather squelchy. Remembering that the last time Daddy offered Mummy help navigating boggy ground, she ended up thigh deep in mud, whilst Daddy kept his feet dry, Mummy is more than happy to let Daddy go first. We find the door, and open it (when we later look back at our arrival footage, this bit is vaguely reminiscent of the 'Blair Witch Project'). We have shelter. And we have it to ourselves. We bring in our gear and have a quick look around. Tom sets about trying to get a fire lit to warm us through, as our coats are sodden. We peel off wet layers and hang them to dry on the hooks on the wall. Time to crack out a celebratory stroopwafel each for two tired little adventurers. Rhoda gets a second wind and wakes up. Ruth watches the fire lighting with interest. There is disappointing news on the fire front. There are stacks of kindling, newspaper and copious supplies of toilet roll, but a sad couple of logs and no coal. This was the first bothy I have arrived at where the previous visitors had apparently made no effort to leave any fuel for those following them. Dead wood lying everywhere, there turns out to be nothing to cut it with. We cook a hasty meal of pasta on the Jetboil (thank God for the speed of the big Jetboil) and get the girls' bedding set up. When I turn around triumphantly with a hot meal, I find Ruth curled up and asleep in front of the fire. We rouse her and persuade her to eat a little before we tuck her into her sleeping bag. We hear nothing from either Ruth or Rhoda until morning - they sleep the sound sleep of little girls who have had a big adventure. Tom and I sit in the living area and look out the bothy book, before we go to bed. There are some very "inventive" entries, and a couple of recent ones warning of less-than-timid mice. We are therefore extra careful to put away all of our food and cooking gear, and to hang up all of our bags well away from the floor. I then spend a fitful night imagining marauding hordes of mice gnawing through packaging and mice crawling across my face. None actually do, there is no sign of any mice anywhere the next morning. On the other hand, one creature that surely has had a midnight feast is the tiny but fearsome midge. Rhoda's face is covered, Tom has been bitten liberally around his hands, ears and back of his neck and I am sporting a few too. Ruth hasn't a single one. Daylight reveals to us for the first time where we actually are. 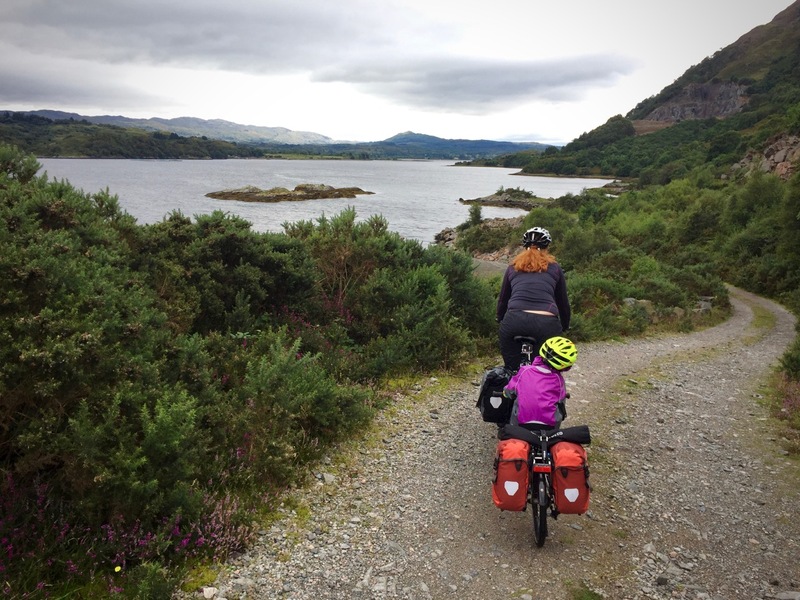 It is still raining, and the views across the loch are less expansive for the rolling cloud over the mountain tops, but still pretty breathtaking. 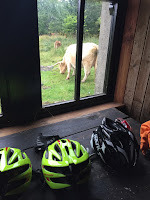 Out of the window, we can see the herd of coos that we encountered last night meandering around the bothy, and a fairly well trodden route shows their habitual track to the water's edge. 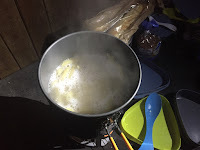 Tom goes out to look for more firewood, and to refill our water bottles from the burn using our new water filter. That should be enough to keep us healthy, but for good measure we also give the water a blast from the Steripen to give any bacteria a neutering. It doesn't taste bad. We all put on our waterproofs and head out for a walk. Exploring, we discover that we are in fact, somewhere really rather beautiful. The views out from the bothy are stunning (even in the rain). 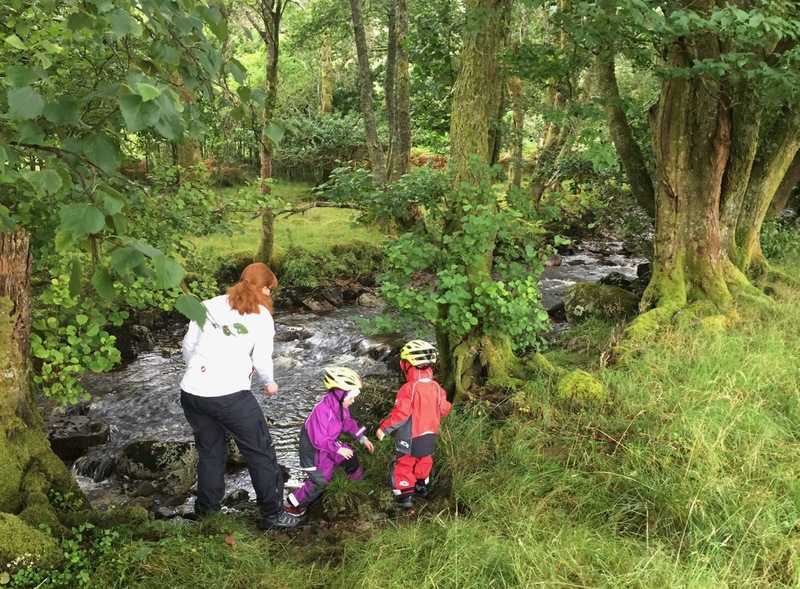 The burn next to the bothy is also very beautiful, and is an internationally recognised and rare geological feature. The sound of the cascading water is glorious. The midges by the water, however, are pure evil, and are unperturbed by the Jungle Formula repellent. 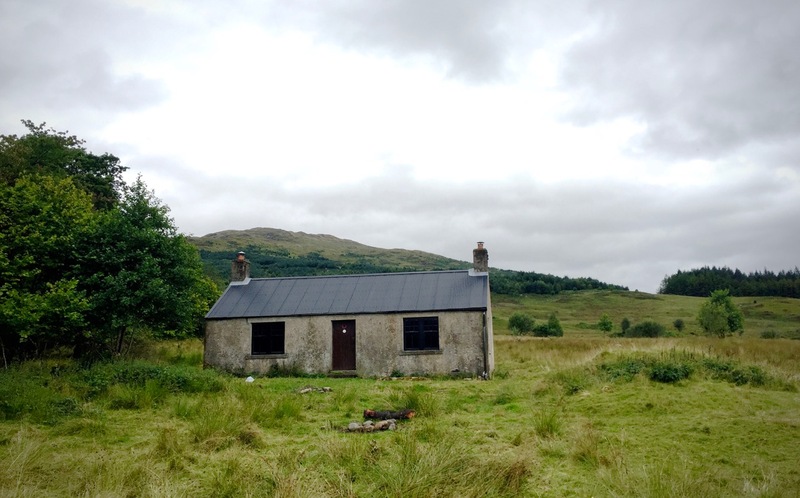 We retreat to the bothy to decide what to do next. Having undertaken such an effort to get to the bothy, and comfortable within it, we debate the merits of trying to stretch out our stay to another day. Water is no problem, but we only brought food rations for an overnight stay. We have (as always) a stash of extras, but not a huge amount, and there is no fuel. Any wood we collect now will be sodden and not really ready to burn immediately. 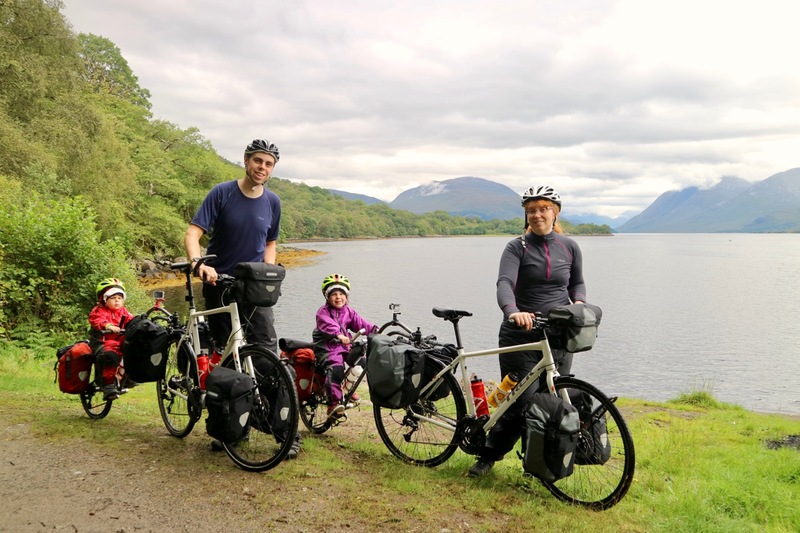 We contemplate sending Tom out on a solo mission toting empty panniers to bring back food and fuel, but it is a decent ride to the nearest place, and he will be gone for several hours if we take this option. With the rain falling, the girls will soon be fed up of being cooped up. The bothy is equipped with a library, but the titles it stocks are a little mature for a 3 and a 4 year old. We therefore pack up our things, and decide to head back to the car. The journey back takes nowhere near as long in daylight as it did last night - we make quicker progress across the loose sections with the confidence that daylight brings (especially the downhill parts!) and pause to enjoy the views out. We encounter only one person during the whole of our trip, and he turns out to be a certifiable nutter. I say encounter because he was hidden in the undergrowth (we didn't ask what he was doing) and proceeded to offer (unbidden) a detailed account of his entire life and the plot of a self-published book he was writing, set in the future after we have colonised Mars, invaded the Netherlands but seceded from Scotland, and involving various members of the Royal family in acts of unspeakable perversion and debauchery (working title, "Good f***ing, my liege, Good f***ing", naturally). I ended this particular encounter (having blundered into it only after Tom and Rhoda had been captive for some minutes already) by saying "Girls, close your ears. Nice to meet you, but we're leaving now. Goodbye!" We may have just missed out on first reading the of next literary blockbuster to come out of Bonawe - we will never know (but I'm ok with that!). This is called the perfect family outing. 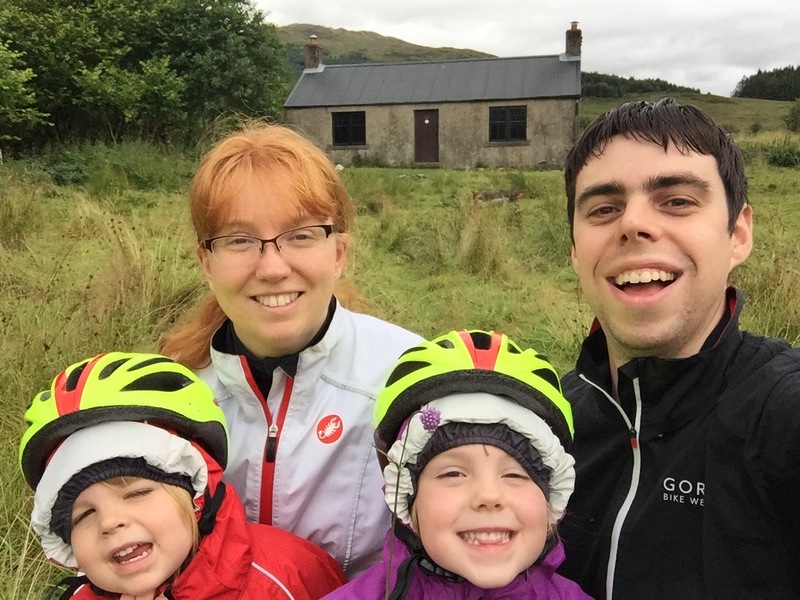 I am glad to see that your whole family is a fond of bicycle riding. Its indeed a fun to have your own family side by side.